Do you dread Mondays? Does the sound of your alarm clock going off send your spirits sinking into despair? Do you glide to work with a smile on your face or drag yourself there? All of us experience some kind of work-related stress at some point in our careers, and it can have grave consequences in other aspects of our lives. The good news is that you don’t have to let stress get you down. 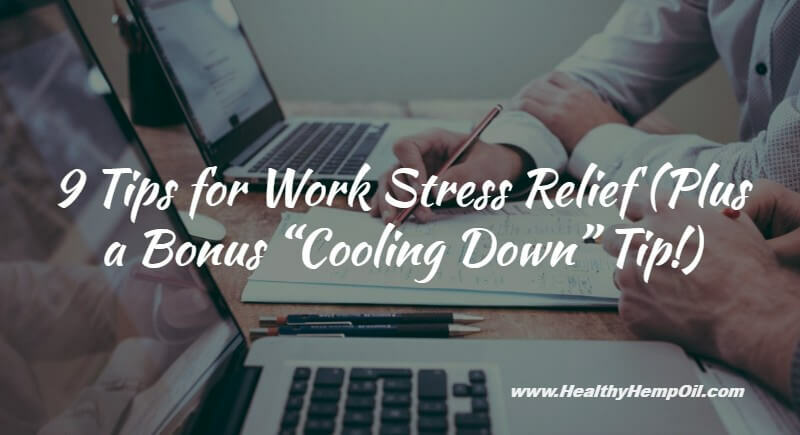 This article will share some easy and effective strategies for work stress relief you can start using right now. Stress, in our fast-paced society, is inevitable. And workplace stress, in these uncertain economic times, seems unavoidable, with fewer staff expected to work longer hours for less pay. Tight deadlines, frustrated colleagues, an overbearing boss, lack of appreciation or encouragement, and increased pressure to perform all contribute to work stress. While a little stress can be OK, keeping us on our toes and motivating us to get things done, too much quickly makes life unbearable in and out of work. Scientists agree that stress is a killer. Stress-related conditions cover everything from baldness to chronic heart disease. Not only that, but stress exacerbates just about any illness. A holistic approach is the most effective way to reduce workplace anxiety. Try some of the work stress relief tips below to tackle stress triggers and support your body’s self-healing. Let go of the need to be perfect—It’s OK not to be; no one is! If you’re constantly striving for perfection, you’re putting additional pressure on yourself. Strive for “good enough” instead, and pat yourself on the back for getting there regardless of whether it’s recognised by your boss. This will not only reduce your stress level but also keep your self-esteem healthy. Don’t be a control freak—How much of your stress is triggered by things you have no control over, like other people’s reactions or tone of voice? Identify the things you can control—your own reactions—and decide to respond in a calm, measured way while letting go of the uncontrollable. Check out the cooling down tip at the end of this article! Stop multitasking. Yes, they often say this is the mark of a successful person. But, in fact, multitasking makes you slower and less efficient than if you just focus on one thing. Zeroing in on one task means you’ll do a better job first time. Prioritizing and list-making will create organization in your mind and help you concentrate, because you won’t be worrying about forgetting something. Glide to work. How many of us stumble out of the front door still munching toast and planning to finish those meeting notes on the train? That doesn’t make for a very serene start to the day. Pack your bag and set out your clothes the night before, and turn your morning commute from flustered rush to serene glide. Plan regular breaks. Many of us think, if we work non-stop for 8 hours, we get more done. But the truth is it makes you less productive, more stressed and with even less energy for the important things—life outside work. The Energy Project finds that taking regular breaks not only clears stress but helps retune the mind. So take 10 minutes, grab a cup of herbal tea or a handful of nuts, speak to a friend, just get away from your screen, and you’ll return to your desk feeling focused and ready for the next task. Do lunch. A key aspect of work stress relief is a proper lunch break. Wolfing down your food in 4 minutes flat while checking emails and posting to social media will only stress you and your body. Slow down, enjoy your food, and let your lunch be a time to recharge your batteries so you can be your best the rest of the day. Connect. Feeling lonely or isolated only serves to make us more stressed. Reach out to friends. Simply talking about an issue can help you let off steam and return to a place of calm. Build new friendships, both in and out of work. If you’re shy, go to a class or workshop—it’s much easier to connect with people over a shared interest. Don’t just turn to your smartphone during work breaks. Why not engage a colleague in conversation instead? Do what makes you happy. If you’re unhappy with your work, think about your options. Could you rewrite your CV? Do you have a passion you could make a career out of? Even if you think you’re stuck, there are thousands of resources that can help you turn your skills into the perfect job for you. Don’t be afraid to explore the possibilities! Love your body. Stress causes all manner of health issues, including headaches and digestive troubles. And if your body doesn’t feel good, of course you don’t either. Give your body some love by taking care of the 3 fundamentals of energy: food, movement, and sleep. Food: After a disastrous meeting, anyone would reach for cookies to confirm to themselves that pleasure still exists in this world. But while they may provide short-term comfort, in the long term these choices play havoc with our health. A healthy diet is a key component to work stress relief. Go for whole foods that will nourish your body and boost your mood. Raw chocolate, chia seeds, fruit and quinoa all contain nutrients essential to mental well-being. Movement: Exercise is a well-known mood booster. Can you incorporate more movement into your day? Why not take a stroll at lunch, walk some of the way home, or try a video yoga class? Next time you feel tension mounting at work, go for a brisk walk – stepping away from a situation can often diffuse it. Sleep: If you’re stressed, you’re probably not sleeping enough—you’re up all hours worrying or waking up at dawn in a cold sweat thinking about that report you need to hand in. Spend time away from the screen—the blue light emitted by smartphones and TVs is known to disrupt sleep. Sleep is sacred—set up your nighttime routine so you get 7-8 hours of undisturbed slumber. When you wake up refreshed, you’re more likely to have a great day. We’ve all been there: a colleague’s taken credit for our work or isn’t pulling their weight or has gossiped about you, and things are getting heated in an exchange. When you feel the situation may get out of hand, try the cooling breath technique. Breathe in through your mouth as if you were sucking a straw. You’ll feel a cool, dry breeze on your tongue. Then breathe out slowly through your nose. This gives you a second to pause, allowing you to think about your reaction and choose a calmer one. This also gives the other person a chance to step into the present. We work to live, not the other way around. While you may not have direct control over who you work with, how much overtime you do, or how tight the deadlines loom, you can take steps to manage your stress. Setting realistic expectations, nurturing your body, exploring your passions and connecting with others will help you banish stress from your life, so you can get back to living happy. Have you experienced work stress? What were your triggers? How did it affect your life? How do you overcome difficult situations at work? Are you planning to try any of the tips listed? We’d love to hear your thoughts and feedback, so feel free to drop us a line in the comments section!